For those who want a simple, long, hilly run with great views, this is your spot! Maroon Creek Road runs for 9.3 miles between the Aspen roundabout and Maroon Lake. 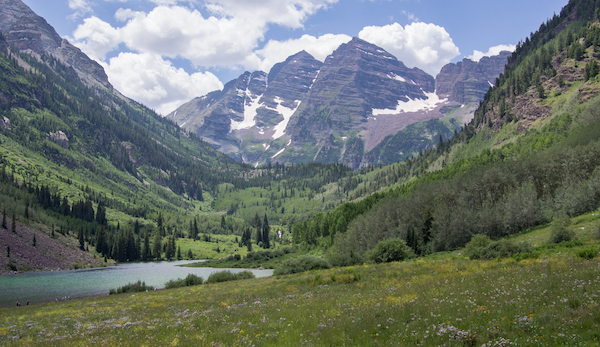 There are great views, especially as you reach the Maroon Bells at the ~4.7 mile mark. From Aspen, this is a steady climb of about 1,500 feet. It’s fairly gradual, but gets steeper (5-7% grades) after mile 6. One bonus: Maroon Creek Rd. is closed to cars from 8:30am-5:00pm from mid-June through Labor Day. For those who want to modify the route, there are some bus shuttle options. A bus runs from Rubey Park in downtown Aspen to the Aspen Highlands base area (the ~2 mile mark on Maroon Creek Rd.). A shuttle bus also runs between Maroon Lake and Aspen Highlands, making a one-way run possible.